With her live recording of the opulent Elgar concerto at the beginning of 2013, Catherine Manoukian demonstrated how she lends a lean, precise and yet emotional character to the Romantic repertoire. 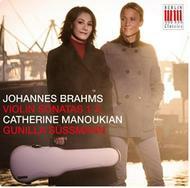 That same quality is fully evident in her new recording of the three Brahms Sonatas - together with her Norwegian accompanist, Gunilla S�ssmann, she presents a reading of Brahms whose seemingly restrained surface is barely able to conceal a rich inner emotional world. This is particularly appropriate in the three violin sonatas - the composer, normally a very reserved man in his private life, here quotes songs of his own that provide some insight into biographical context. The nicknames sometimes given to the sonatas, of 'Regenlied', 'Thun' and 'Symphonic', give a hint at their inspirations and reveal how Brahms uses the intimate framework of chamber music, expanding it and taking it to the instrument's technical limits. This recording succeeds in making this audible at the highest level of intensity while always maintaining the fabric of the motifs and the formal structure: here is a modern, lean reading that nevertheless does not lack emotion and depth.